With both increasing population density and growing environmental awareness the general public is becoming more and more aware of the relevance of industrial and agricultural odor emissions. Even if unpleasant smells do not necessarily have a direct impact on health, they can be irritating to the extent of having a substantial negative impact on life quality. For this reason and under the given environment protection legislation, undesired odors have to be reduced to an acceptable minimum. At the Department of Odor Management, we evaluate odors by means of olfactometry, odor surveillance and collection of test subject results. We assess odor management measurements and develop new processes for the reduction of undesired odors. We look back onto longstanding experience in successfully execution of odor projects for the industry and public authorities.This has been achieved by combining experience with innovative ideas from various technical fields. Do you require support in evaluating odor emissions or immissions? Would you like to assess the actual effectiveness of an existing odor repression system or the impact of certain odors on the environment? 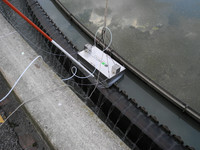 Are you considering developing an odor management system and you are interested in leveraging your project not only with the technical know-how available at the HSR University of Applied Sciences Rapperswil but also with state funding (for example by the Commission of Technology and Innovation, CTI)? Feel free to get in touch - we look forward to hearing from you!